PrestaShop comes multilingual out of the box. This tutorial explains how to localize and translate your PrestaShop E-commerce into different languages: product catalog, categories, pages, theme, modules, etc. PrestaShop is multilanguage by default. You can make a multilingual store easily. PrestaShop core is already translated into more than 65 languages. Translations have been made by the PrestaShop community through CrowdIn (collaborative translation platform). Product catalog: title, description, attributes, friendly URLs, SEO data, etc. Using machine translation is the cheapest option, but not the most advisable since translations often don’t make sense and Google could consider them as spam. In PrestaShop, it is very easy to install a language pack that include not only translations, but currencies, taxes, units, etc. 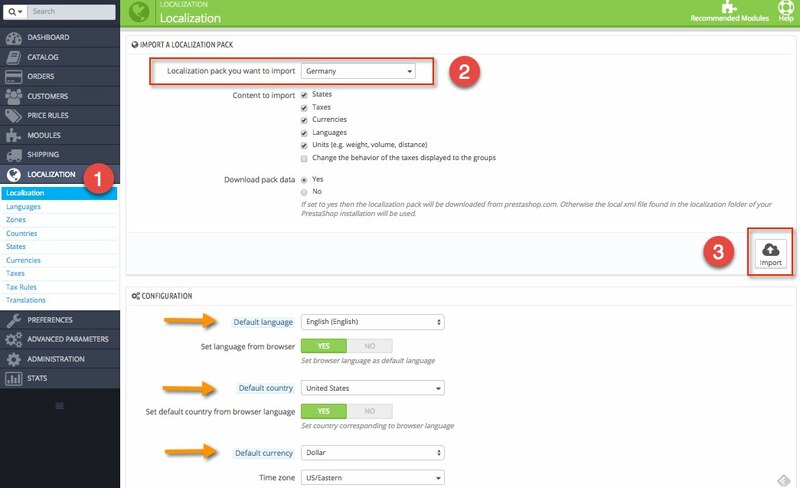 Navigate to LOCALIZATION > Localization, choose a country and import a language pack. On the same page you can also set the default language, country and currency. Once language pack is installed, go to LOCALIZATION > Translations, and you can view and edit translations. Front Office. Translations are visible in store for customers. For example, Search = Buscar, i.e. the text that appears in PrestaShop search engine. Error message. Error messages translations. For example: The Zip/Postal code you’ve entered is invalid. It must follow this format: %s = Código postal inválido. Debe ser escrito como sigue:%s. As you can see some of these expressions use special syntax (for example: %s). You must use this syntax in your translations. Installed modules. Translations used by the installed modules. Email templates. Email templates translations. Missing translations in some languages (marked in pink). Keep in mind that translations have been made by PrestaShop community. Maybe you installed a module or theme that doesn’t come fully translated into your language. You may want to customize the texts in your store: it is not the same selling luxury jewelry or skateboards for teenagers. 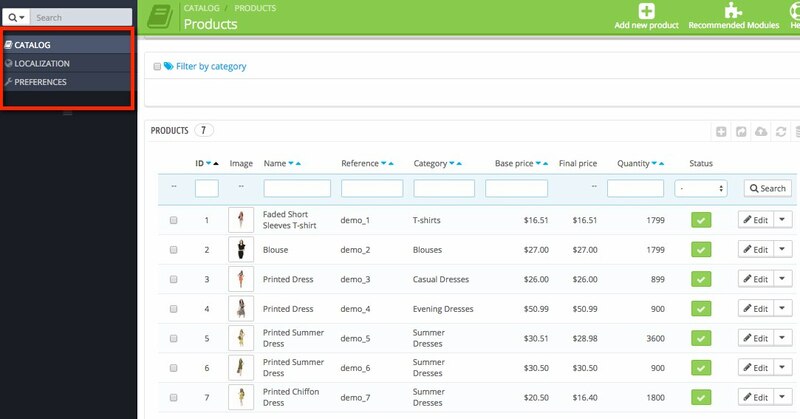 The most important parts that must be translated in PrestaShop are the product catalog and static pages. These contents must be translated into the PrestaShop editor. If you do not want translations to be displayed until they are completed, you can disable languages in LOCALIZATION > languages. The translation of the product catalog is the most important part. Next to each field you will find a language code, which enables you to choose the language into which you wish to edit translations. 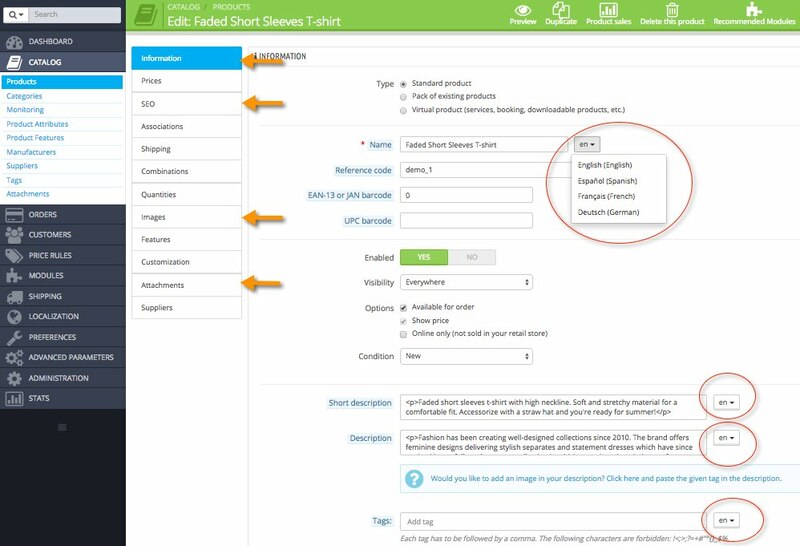 When you import a new language pack, PrestaShop automatically copies the texts of the default language into the other languages, so whenever you choose a language from the drop-down menu you will have to overwrite texts. Note: To translate titles in blocks you will have to go to MODULES > Modules > CMS Block, and edit names. 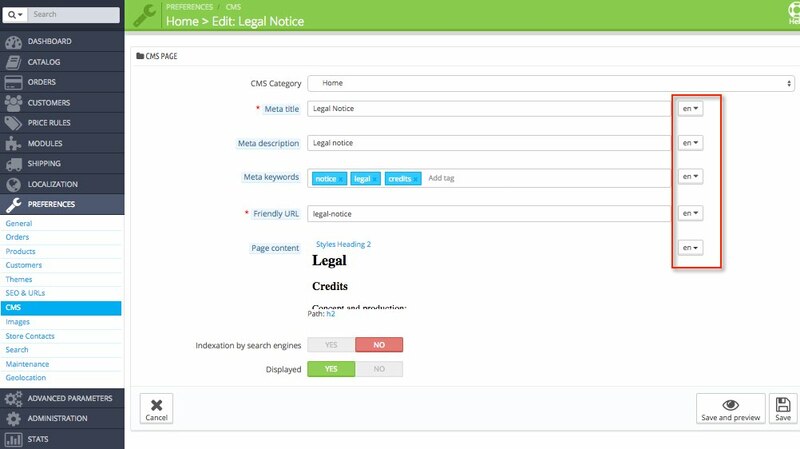 PrestaShop allows you to create users (referred to as employees) with translator’s profile, so that it can perform translation from the administration panel. Translator will have access to the contents that need to be translated, but not to private data (customers, suppliers, sales, expenses, etc). Adding a new translator is pretty straightforward: navigate to ADMINISTRATION > Employees > Add new employee. When it creates a profile in PrestaShop (either logistician, translator or salesman) you can choose the language from the admin panel. Each user can also change their preferred language. The more complex part comes when setting the new profiles access rights. This is done in ADMINISTRATION > Permissions. If you don’t want to give access to the translator, another option is exporting contents in a CSV file to send it to the translator. In this case, the translator could use their Computer-assisted translation tool. This can be done by accessing the database using phpMyAdmin, but this requires advanced knowledge. Machine translation. There are different modules that allow machine translation (Translate all, Google Translation, etc.). In my opinion, it is not advisable to use these modules, since in most cases translations do not make sense. Edit translations from the frontend (Inline Translation module). It allows you to edit and make translations from the Front Office. Personally I prefer to edit the translations from the Back Office. Translation modules that connect to online translation agencies. Some online translation agencies have developed specific modules to make easier the process of translation, such as TextMaster or Dixit.